Intel has been reeling under pressure from it’s delayed shift to 10nm process and AMD is catching up really fast, offering a lot a great products including the 2nd Gen Ryzen series. 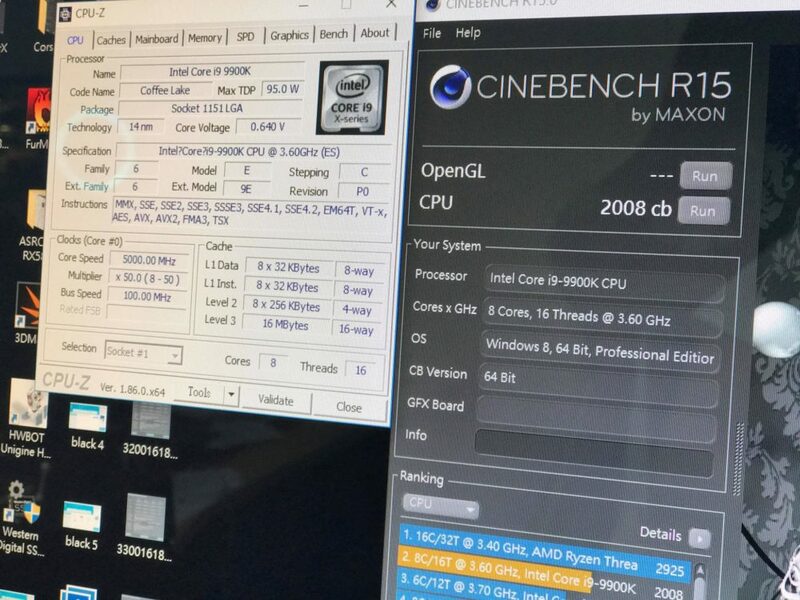 But there might be some good news for Intel fans, if a leaked Cinebench R15 benchmark for the i9-9900K is believed. We know from quite sometime that Intel will be coming out with their 9th generation coffee lake refresh processors soon. 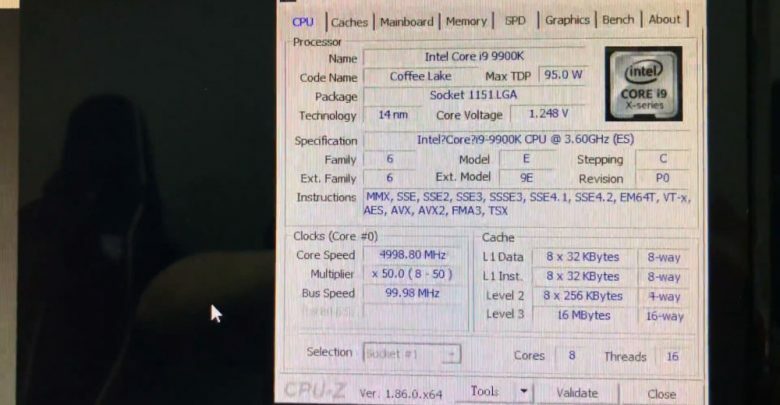 It seems the i9-9900K will be the flagship processor for the Intel’s 9th Gen lineup. Unlike previous i9 processors, it will be a mainstream product, also the first mainstream desktop processor from Intel with 8 Cores. The chip will have 8 Cores and 16 threads, running at a base clock of 3.6 Ghz and boost clock of 5 Ghz only in single and dual core workloads. The 9900K will also have 16 MB of L3 cache, along with the Intel UHD 620 integrated graphic chip. This processsor will run on a TDP of 95W, which is standard for a desktop octacore processor. The interesting thing to note here is that 4 of the cores max out at 4.8 Ghz and 6/8 cores at 4.7 Ghz. Overclocker enthusiast Lau Kin Lam posted this video, testing the i9-9900K in Cinebench. You can see from windows taskmanager that all the cores were running at around 5 Ghz, during the benchmark. The i9-9900K received a score of 2166 points, which is quite impressive. It’s definitely faster than the Ryzen 7 2700X, but also costlier at the same time. Given that it has a boost clock of 5 Ghz, it will have very impressive single core performance, which also translates to better gaming performance. Although single core performance has been one of Intel’s strength for a long time. There was also another leak from someone named ‘yearsoldangus’, it received a slightly lower score of 2008 points on Cinebench. Many 9th generation motherboards coming out soon, we also reported on a few of them, you can read more here. There’s no doubt that the i9-9900K will be a good performer, but Intel processors are seeing a rise in prices across the board due to a production shortage. Given that AMD is also working on the launch of the Ryzen 7 2800X, uncompetitive pricing will hurt the i9-9900K.